How Do You Become a Trauma Nurse? If you want to become a trauma nurse, you will need to have the inherent skills that you need to work in a stressful environment and the training you need to qualify for the title. As a professional who works in Intensive Care Units or Emergency Rooms, you must be prepared to stabilize patients who have serious injuries while still dealing with distraught family members who are concerned about their loved one’s condition. It takes a special nursing professional to work in life-or-death situations on a regular basis, but it also takes someone who is willing to complete academic training. Read on, and learn how you can become a trauma nurse. your RN license. All nursing professionals must pass the National Council Licensure Examination to become an RN. After passing this exam, you will need to register in the state where you will be practicing. Passing the exam will make you a licensed entry-level nurse. When you are officially a Registered Nurse, you should look for job openings in an emergency room or a related setting so that you can observe what trauma nurses do. You will also be able to gain experience working with patients who are ill and have traumatic injuries. This will help you decide if you have the skills that you need to deal with the stress and with the types of injuries that come in to be treated. After you get experience in the right setting as an RN, your next step will be to complete field related courses and earn certifications that are relavant to trauma care. One great course to take is through the Emergency Nurses Association. It is called the Trauma Nursing Core Course and will help professionals learn how to identify life-threatening injuries and how to asses patients and intervene for the best outcomes. After you have completed the 2-day course and hands-on training, you can move on to studying for certifications. 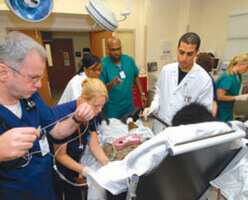 The Certified Emergency Nurse is a great option if you would like to enter the field. It will show that you are qualified to work in a trauma setting and that you know the standards of care that you need to meet to work in the field. You can start a career in trauma nursing with your license and certifications, but having a Master’s may get you further. Due to the fact that more than 20 percent of emergency visits are to treat injury, there is a growing need for trauma nursing professionals. If you are ready to complete specialized trauma training courses and certifications, it is time to get started. Be sure that you are naturally equipped to handle chaotic situations, and take the steps to become a trauma nurse to find your purpose.